This conference will focus on the environmental challenges, especially climate change, to agricultural sustainability in the Lower Mekong Basin of Laos, Thailand, Cambodia, and Vietnam, with special attention to Cambodia and Vietnam. The conference will consist of interdisciplinary paper and poster presentations by both scholars and practitioners. Proposals that consider Mekong Basin agriculture in a larger historical and cultural context, in political and environmental dialogue with other countries in the region (e.g., China), or that are comparative are especially encouraged. The Mekong River is the longest river in south-eastern Asia and one of the longest in the world. It rises in eastern Tibet, flows through China and between Laos and Myanmar, and connects with the Tonle Sap (the largest natural freshwater lake in SE Asia, whose enormous ecological vitality depends on Mekong waterflow) in Cambodia. It then separates into several distributaries to form the Mekong Delta. The lower reaches of the Mekong River are the most important flow of water in the region and historically essential to the livelihoods of many who live there. About sixty million people who live in the Lower Mekong Basin altogether, about three-quarters rely directly on agriculture and the natural resources of the Mekong system for food and livelihoods. The Tonle Sap is the largest freshwater fishery in the region and produces as much as two-thirds of the protein in Cambodia’s food supply; the Mekong Delta of Vietnam is one of the most productive agricultural areas and premier rice granaries in the world. 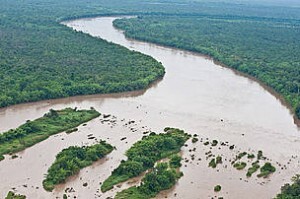 An enormous flow of water through the monsoon belt and an accumulation of alluvial soils means that this is already a dynamic environment that has required intense attention to the nuances of environmental change by inhabitants, in order successfully to wrest livelihoods from Mekong riparian environments. A number of changes in the recent past has made this an even more dynamic and challenging place in which to make a living. The changing way in which the region has been linked to larger flows of commodities and capital over time has also had an impact on the region: For example, its re-emergence in recent decades as a major rice-exporting area has linked it inextricably to global markets and their vicissitudes. Dam-building in the upper reaches of the Mekong threatens the seasonal surges of water that make the Tonle Sap so productive, at the same time that decreased waterflows and the potential for sea level increases because of global warming has added a new threat in the Mekong Delta – one for which this last year’s drought has provided a rehearsal. Cambodia and Vietnam are among the most vulnerable areas in the world to climate change, because of the tangible effects of climate-caused environmental change, but also because so many of inhabitants depend on agriculture and fishing, with little margin for error, for their livelihoods. Since only a fraction of global greenhouse gases come from this region, larger environmental justice issues are at stake as well. How governmental policy and resident populations will adapt to climate change as well as several other emerging or ongoing environmental and economic problems in the Delta – and what policy makers can learn from history and from similar experiences in riparian environments elsewhere in the world – will be the foci of this conference. This two-day symposium and the follow-up field trip will provide an excellent opportunity for international and local scholars, scientists, and practitioners to exchange information on the history of agriculture and environmental problems in the Lower Mekong Basin; to share the latest research findings and achievements in developing strategies for sustainable agriculture and fisheries and climate change adaptation in the region; to analyze Mekong Basin agriculture in a larger historical and cultural context; and to identify future demands and enhance research collaborations for mitigating and adapting to environmental problems and developing sustainable agriculture in this region. We hope to create a volume of finished scholarly and research papers by way of this conference – on the model of a collection we developed from a conference on a similar theme in Vietnam in 2010: http://www.springer.com/us/book/9789400709331. The conference will be sponsored by the Department of Natural Resource Management and Development at the Royal University of Phnom Penh (RUPP), Western Washington University, and the Global Research Institute at the University of North Carolina, Chapel Hill. Participants can find accommodations in hotels with a full range of prices in Phnom Penh; assistance with bookings can be provided. Phnom Penh has an international airport that is served by most international carriers. The deadline for proposals is December 1, 2016. Proposals should include a 300-word abstract, a 2-page c.v., and contact information. Papers of participants will be due on March 1, 2017. Proposals can be sent as an attachment to an email and should be sent both to Professor Mart Stewart, Department of History, Western Washington University (Mart.Stewart@wwu.edu) and Dr. Seak Sophat, Head, Department of Natural Resource Development and Management, Royal University of Phnom Penh (seak.sophat@rupp.edu.kh).